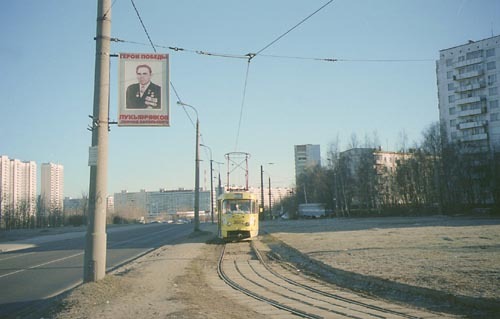 Bratcevo terminus at a crossroad of Panfilov Heroes Street and Jan Rainis Boulevard in the far north-western outskirts of Moscow is realtively young compared to many other tram termini. 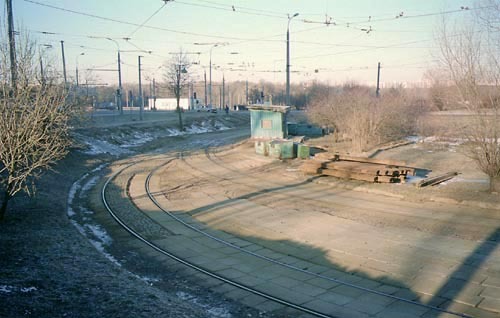 The regular service reached here on February 21, 1969 when the existed line was extended from its previous terminus at Zakharkovo. The inhabitants of a large new Bratcevo district instantly got a convenient link with a central part of the city; today this link would probably be called a pre-metro or light metro but those aliases were not used in USSR back in 1969... But the dwellers of another huge residential zone Mitino that emerged nearby a decade later were not so lucky: tram was again considered an old-fashioned rusty transport, but there were no enough funds to build a heavy Metro line there at once, and as a result there is no rail link with that district until today! Hundreds of thousands people daily move to and from Mitino by hordes of diesel buses and by motorcars producing severe congestion, but the situation is not to be changed in the foreseeable future. 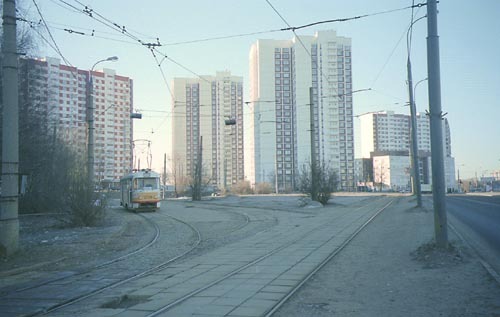 An overview of the terminus, with modern apartment houses behind it. Although the picture was taken in the middle of March, there are only a few traces of snow in the street - the Spring of 2002 was very warm and early in the central Russia. A tram of route 6 arrives at its final destination. A plackard on the mast is devoted to one of the veterans of World War II who lives in this district - this is a rather rare but valuable sample of non-commercial visual installations in Moscow. The home points and several pieces of spare rails and sleepers. The tracks were completely renewed in 2001 - to say the truth, track maintainance in Moscow is at a much better level today than a decade or two ago. 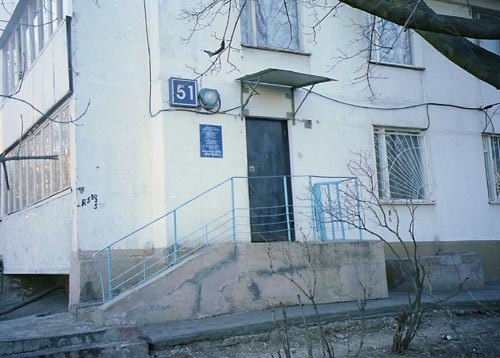 A control room of this line is located on the first floor of a standard residential block - a common practice for many such facilities in Moscow.